The Cinque Terre are five small medieval villages perched on a rocky coastline overlooking the sea in eastern Liguria , Riviera di Levante. Declared a UNESCO World Heritage Site, the National Park of Cinque Terre offers its visitors several pedestrian and bicycle paths connecting the five villages of Riomaggiore, Monterosso , Manarola , Corniglia and Vernazza. The trails with different level of difficulty are well marked and run among vineyards, olive groves and medieval villages. You can ride different trails connecting the five centers by Mountain bikes or Regular city bikes: no need of athletic training for the journey , only the usual common sense, useful for dealing bridleways and difficult slopes . The most famous and most scenic route that connects the Cinque Terre, is definitely the ” Sentiero Azzurro –Blue trail ” ( referred to as the route number 2 ) . About 15 miles long , it connects Riomaggiore to Monterosso. The first segment from Riomaggiore to Manarola is the easiest and is known as ” La Via dell’Amore-The Way of Love ” , for its romantic views of beautiful medieval castles. Once you reach Corniglia , take the bridge over the Rio Canale della Groppa for a scenic view the beach of Guvano . From here the route climbs up to the village of Prevo , the highest point of the ” Blue Trail ” . You will continue to Vernazza among olive groves first and flourishing vineyards. Then bike along the scenic coast of Messorano to the scenic valley of Cravarla , until you reach the basin dell’Acquapendente among lemons and vineyards and to the final destination of Monterosso. 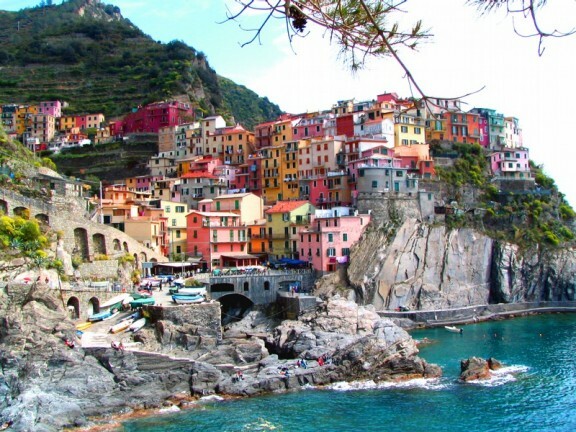 Tourcrafters offers different tours featuring a day or more experience to Cinque Terre. for the Bike lovers a 6 days biking tour from Genova to La Spezia starting at $1,299. Call 1.800.Italy95 and ask our Reservation agents for details. Previous Post We love Pasta and we want to share it with you!